This is an essential building block that replaces the physical Abacus in the child’s mind. 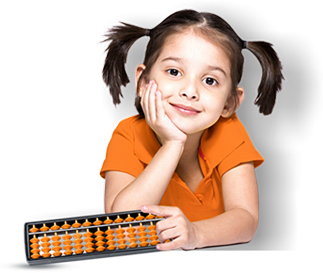 As the children gradually learn to visualize the Abacus in their mind (virtual Abacus), they learn to calculate mathematical problems using the principles of the Abacus, without the use of the physical tool. Starting with an Abacus and eventually progressing to Mental Math, these young “math magicians” learn to do all arithmetic calculations of up to 10 digits in their head, without relying on aids such as calculators or paper and pencil.